"Value for Money General Introduction into Pickup Artistry"
A lot of subjects packed into this book for a low price. For a beginner who is interested in learning about pick up artistry it's not a bad introductory buy if you are 'gung-ho' about the pickup artist approach. If you are more serious, both Magic Bullets from Love Systems and Revelation from Venusian Arts are more comprehensive (and more expensive) products. Don't buy this if you have already had exposure to pick up artist advice, you'll probably have seen/ read a lot of the content already. The "Natural Art of Seduction" is an introduction into a lot of the concepts and ideas that were developed in the pick up artist community. It covers ideas about improving inner game & confidence, image and fashion, attracting and seducing women. The author, Richard La Ruina, has studied a wide number of dating authors including Mystery (Erik von Markovik), Style (Neil Strauss), Tyler Durden, David DeAngelo, Ross Jeffries and many others. Gambler has repackaging this knowledge into a system that looks a lot like the original Mystery Method with some modifications and differing emphasis. The tone throughout this book is very informal, relating his own experiences and development and also of a relaxed self help style. The point here is that it isn't a precise manual of technical tactics or approaches, or comprehensive. It flows more like an ongoing discussion of the things that Gambler has found to be important to him, with some of his stories of his own experiences thrown in. For this reason the material is more approachable than some of the other books out there. If you want an easier way to start out and are intent on the 'pick up artist' approach to dating, then this could be a better option for you than working through Revelation or Magic Bullets Handbook, which are comprehensive/ better, but harder work. This book is branded a natural approach to pick up and seduction, and the author Gambler, at times comments that his approach is different to that of the people he learned from. Or emphasizes how his approach is different. In reality though, the biggest difference is its branding. 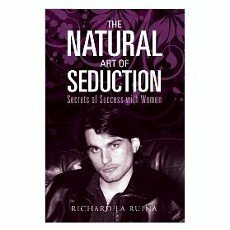 The Natural Art of Seduction takes the ideas from the pick up artist community that have helped the author, Richard La Ruina, personally and combined them with some of the most popular (and helpful) self help advice. If you have studied any pick up artist concepts before don't be surprised to find them reprinted in this book word for word. There are many examples of routines given for example, most of them taken from the stash of routines popularized by Mystery, Neil Strauss and TD. There is one section where a more natural approach, if you can call it that, to pick up does come through however. Discussion of 'connecting with women', relating to them and holding good conversations were useful additions - and more original. The best of these was the part on conversations which has quite a bit of practical advice on how to structure conversations for guys who struggle to keep conversations going and connecting with women through conversation. This is perhaps the most common stumbling block for men and was the one piece of content that was relatively original in the book.A lot of their content is obviously inspired from NLP (Neuro Linguistic Programming), which Gambler studied previously and Anthony Robbins spoke highly of when he first became popular. Typically I'm not a fan of NLP because it can be a little weird and there is little to no scientific proof of its effectiveness. However I found its use here was down to earth and useful. You are given quite a few examples of lines to use with women throughout the book. The majority are taken from common lines used in the pickup artist community, others I hadn't seen before. Overall I found the quality of these to be average to poor. Lines don't have to be great to work, so you could use them quite effectively. Personally, I shuddered a little at the thought of using them because some of them remind me of the lines pickup artists used to use a long time ago, and others were just a bit cheesy. There is some good basic instruction on some of the things men get stuck on with women. Richard La Ruina seems to have emphasized areas that he had to surmount, and this is helpful for the reader. These include how to keep conversations going with women (as above), how to overcome approach anxiety (fear of starting a conversation with a woman) and building your confidence and kissing women. These are typical 'sticking points' for guys, so the advice is valuable, although . This book attempts to give you a comprehensive system for picking up women, and this is a bit of an achilles heel. Many topics are touched on but not gone into in enough depth to give you a full understanding. The other issue is that you are sometimes introduced to new vocabularly from the pickup artist community fleetingly without proper explanations, which can be confusing. One of the worse examples is where Gambler has quite a lengthy section talking about the evolution of his own image, but surprisingly at the end of it, there are very few tips or practical guidelines given on exactly how you should improve your own image. Where it comes to vocabulary, you are introduced to concepts such as 'frames' and 'sets' without any explanation. You'll probably manage to figure these things out, or if not you could google them and find a quick answer. But this takes away from the value the book could have had to beginners by making it less easy to understand. There is a lot of information packed into this book and the majority of it is good, although in areas it is a bit shallow. For a beginner who is interested in learning about pick up artistry it's not a bad buy thanks to its low price and the breadth of topics covered. If you are more serious however, both Magic Bullets from Love Systems and Revelation from Venusian Arts are more comprehensive (if more expensive) products. If you've already read some advice from one of the pickup artist gurus, or have spent a lot of time reading pickup artist forums, we recommend you don't buy this - as you'll have probably seen a lot of the content before.